NOTE: To access the RDSH servers from off campus, be sure to use the Husky OnNet VPN Service. You will not be able to access the servers without the VPN if you are off-campus. The Microsoft RDC client application is bundled with Windows 7, 8, and 10 (Start menu/All Programs/Accessories) and is available for download for Mac OS X from the App Store as "Microsoft Remote Desktop". 1) After launching the RDC application, the minimal default window is displayed. If you are satisfied with the default settings, simply enter the domain name and select the Connect button to launch your session. That said, selecting the "Show Options" button will display expanded settings that allow you to tailor your session profile and save for future use. Note for new students: Log in with your UWNetID with the syntax netid\yournetid and type your password when prompted. If you received a legacy UWAA account, log in using the syntax uwaa\youruwaaaccount and the password you set up for your UWAA account. 2) If you've selected the "Show Options" button above, the "Display" tab in the expanded settings allows you to set your session display resolution and color depth to better match your local display. 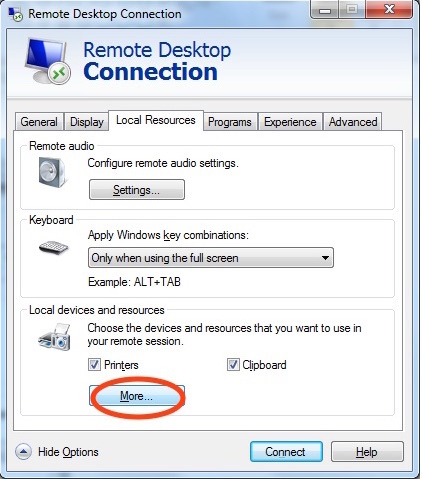 3a) The "Local Resources" tab allows you to map local devices to your remote Windows session. 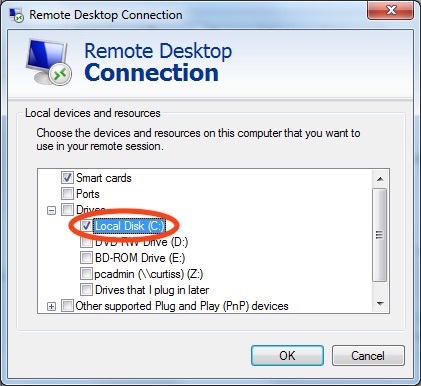 3b) One of the options is mapping your local hard disk to your remote session. 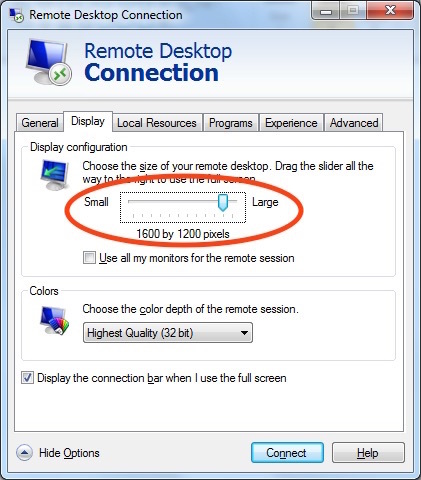 This allows you to move files between your local hard disk and your remote session volumes. 4) When you are satisfied with your session settings, you may save them to a profile that can be launched directly or loaded from the RDC application to open future sessions. 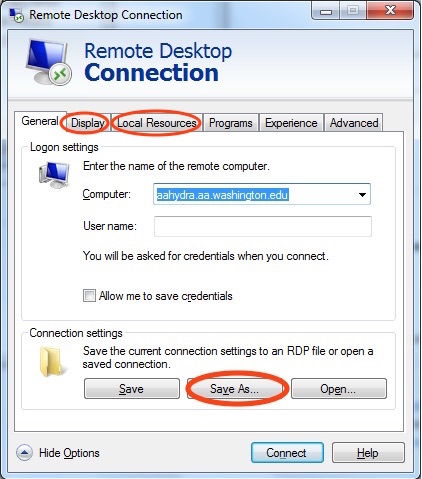 The A&A Windows Remote Desktop servers primary purpose is supporting classwork, but by observing the following conditions, research may be performed on them. Please contact UW A&A Support before attempting to perform research on RDSH-1 or RDSH-2. Excessive memory or cpu utilization -- The 192GB of memory and 32 cpu cores of the RDSH-1/RDSH-2 Remote Desktop servers make them attractive for the large-scale problems that often accompany research use, especially when compared to the 8GB of memory and 4 cores of the GUG 212 workstations or local faculty research labs. But RDSH-1/RDSH-2 have no resource management and it is easy for a single researcher to monopolize an entire server, denying all access to other students. To protect RDSH-1/RDSH-2 for all students, research jobs that are discovered to be monopolizing cpu/memory may be aborted without prior notice. If you anticipate needing more than 4 processors or 8GB of memory, you should instead be using the A&A 19-node Cerberus cluster, with each node having twice the memory (32GB) and Moab/Torque to manage cpu/memory utilization.